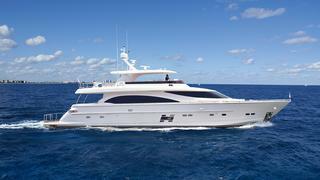 The latest Horizon E88 superyacht has been delivered to her new owners in Florida and named Christine. The 28.2 metre all-GRP fast-planing yacht features naval architecture and exterior styling by renowned Swedish designer John Lindblom. Although she is hull number 18 in the series, Christine is the first Horizon E88 to feature the open bridge layout. 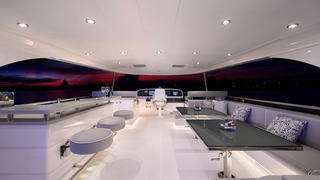 Taiwan-based yard Horizon Yachts added that Christine has also been fitted out with the yard’s new superyacht beach club design, which means that the transom can be completely opened up to the elements via a hydraulic garage door and high-low swim platform, ideal for launching tenders or other superyacht water toys. 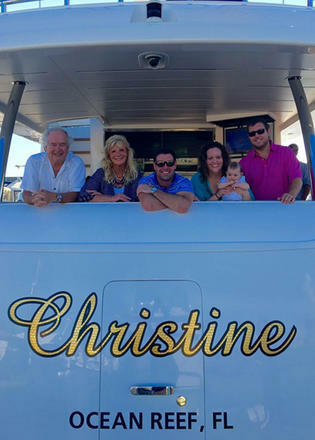 Christine’s new owners plan to spend the autumn cruising Chesapeake Bay, Virginia, before heading south for the winter to explore Florida’s east coast. Accommodation on board Christine is for eight guests split across four en-suite staterooms, including a master suite, VIP cabin and two twin rooms. 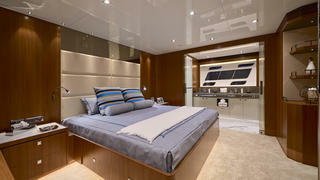 The separate crew quarters aft are suitable for a staff of up to four, while the open flybridge, foredeck dinette and sunpads provide numerous al fresco dining and relaxing options. Christine is fitted out with twin 1,800hp CAT C32 engines for a top speed of more than 20 knots, while zero-speed stabilisers will ensure a peaceful night’s sleep at anchor. With a beam of 6.4 metres, she displaces 71 tonnes. On-going projects at the Taiwan-based yard include the first Horizon E98 motor yacht, Do It Now, which is due to launch in early 2017.